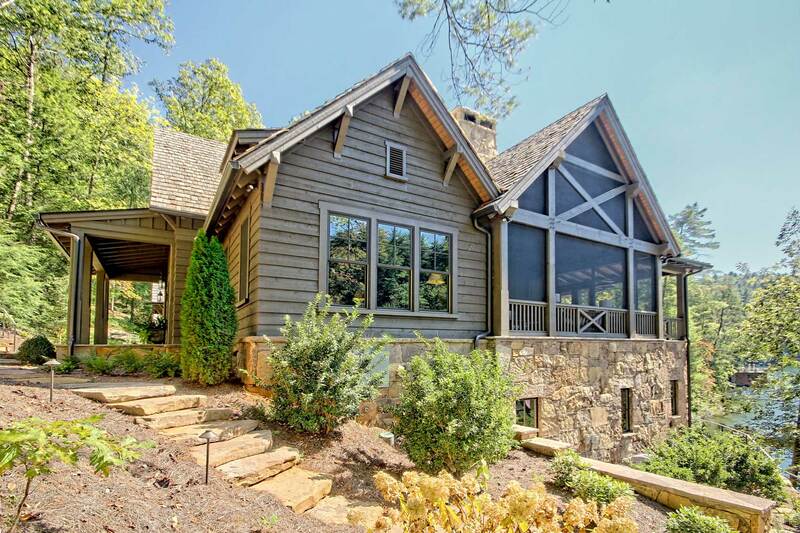 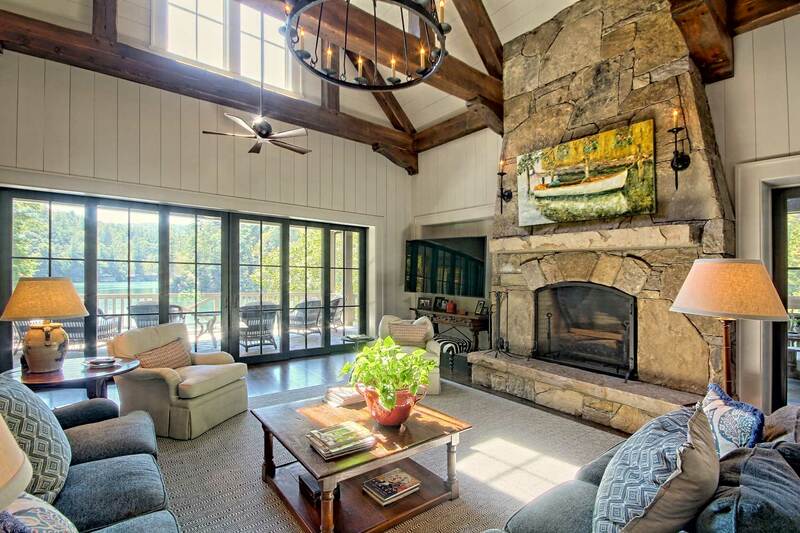 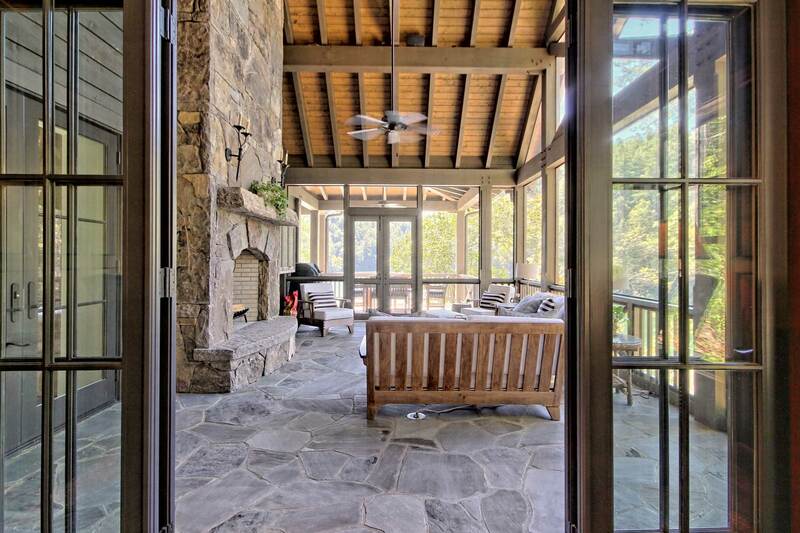 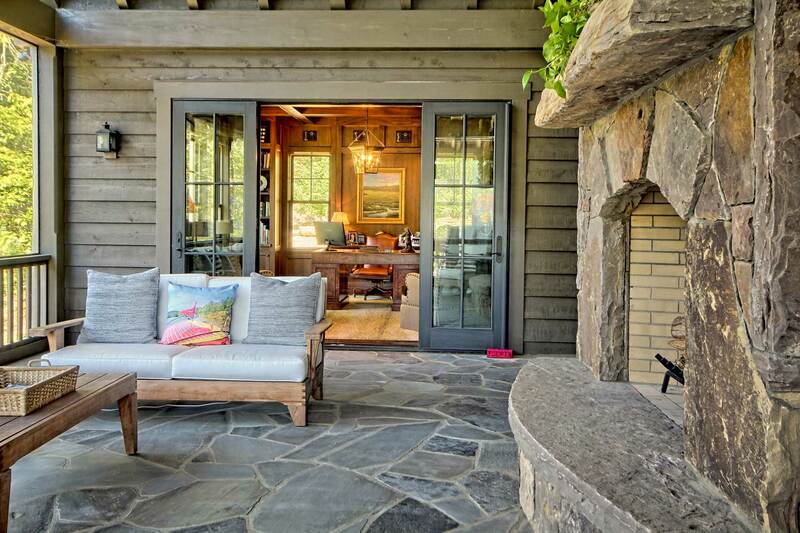 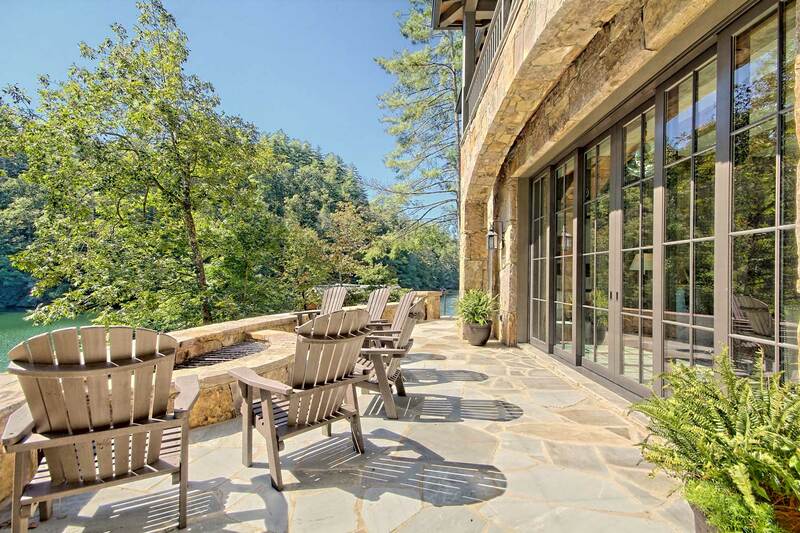 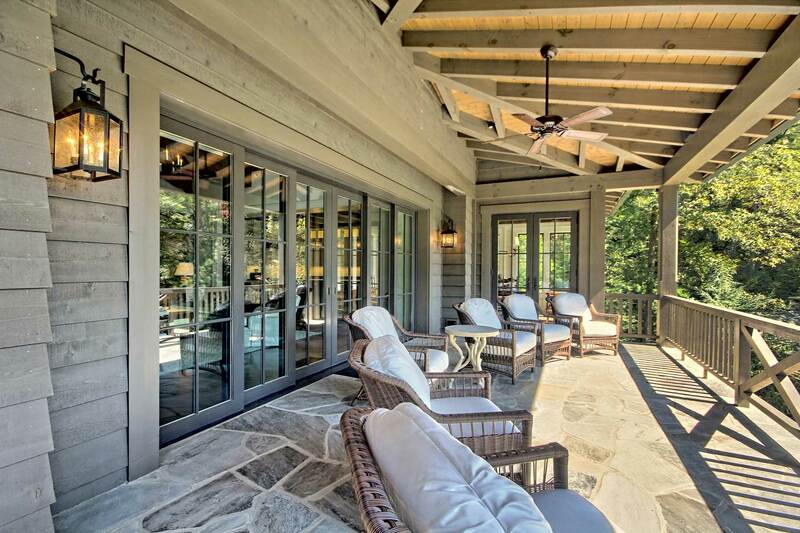 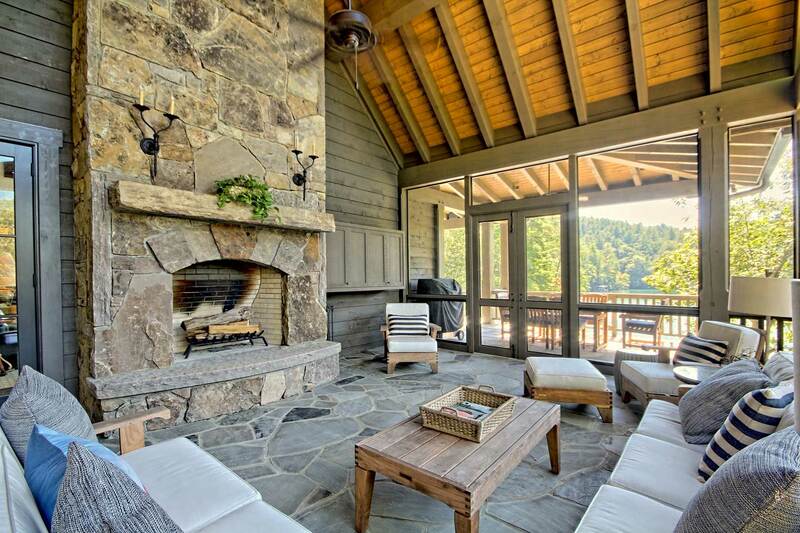 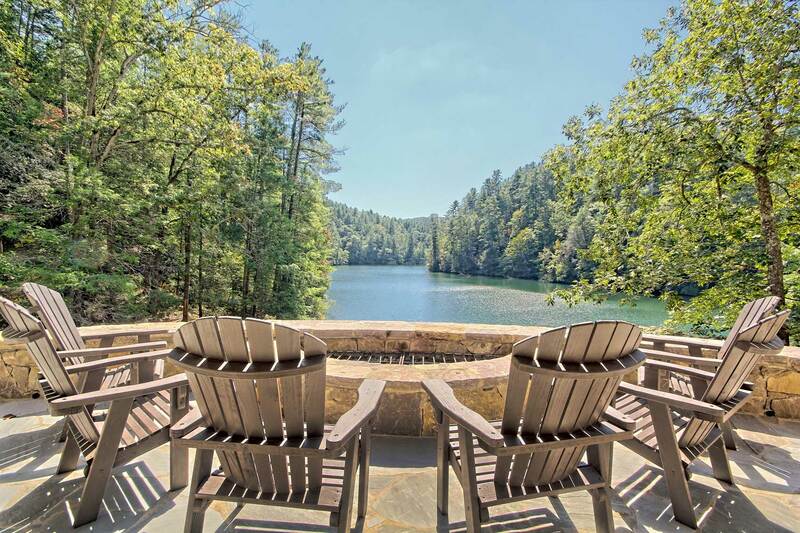 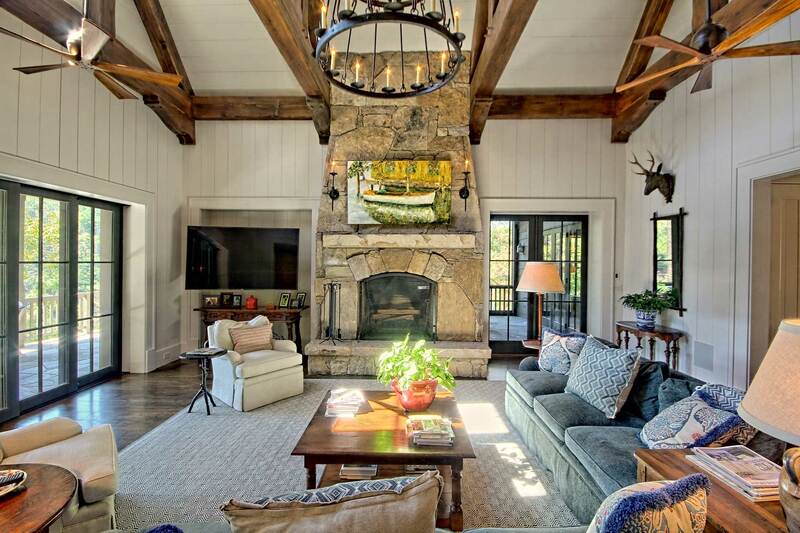 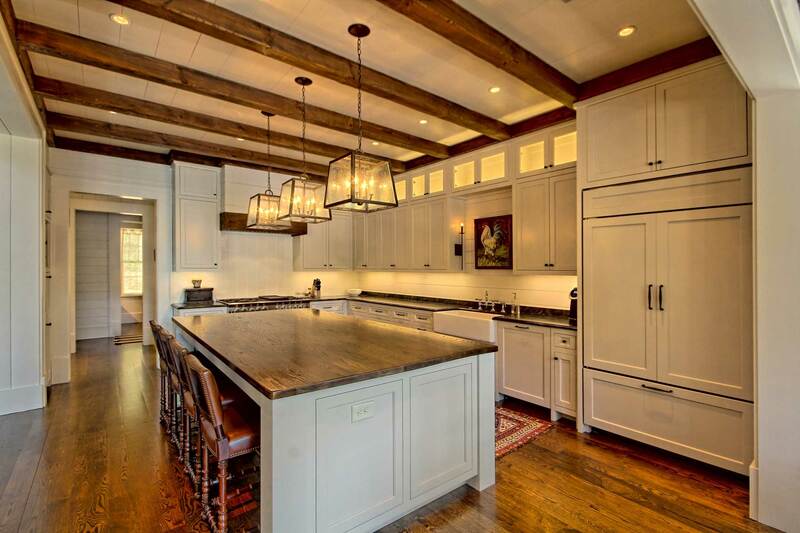 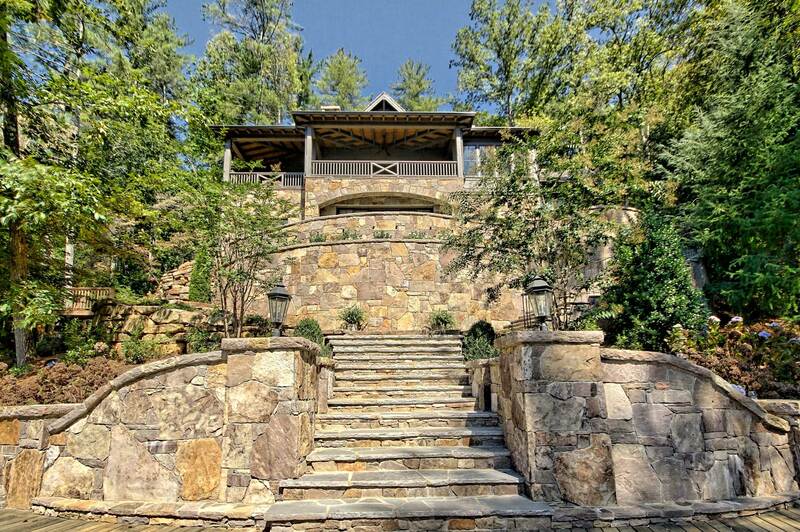 This Lake Rabun farm house is specifically designed for the couple who grew up on the lake and the mountain terrain it sits upon. 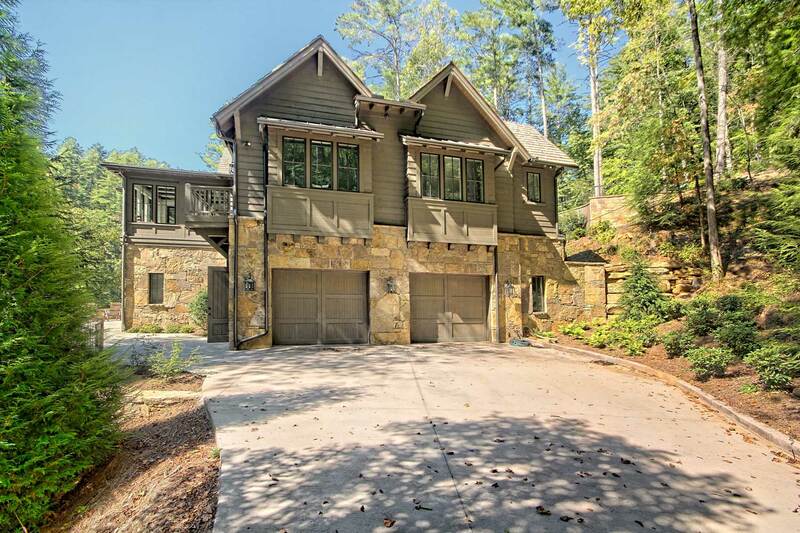 The residence is balanced throughout the design in many ways to reflect the many facets of the home built on a lakefront mountain site. 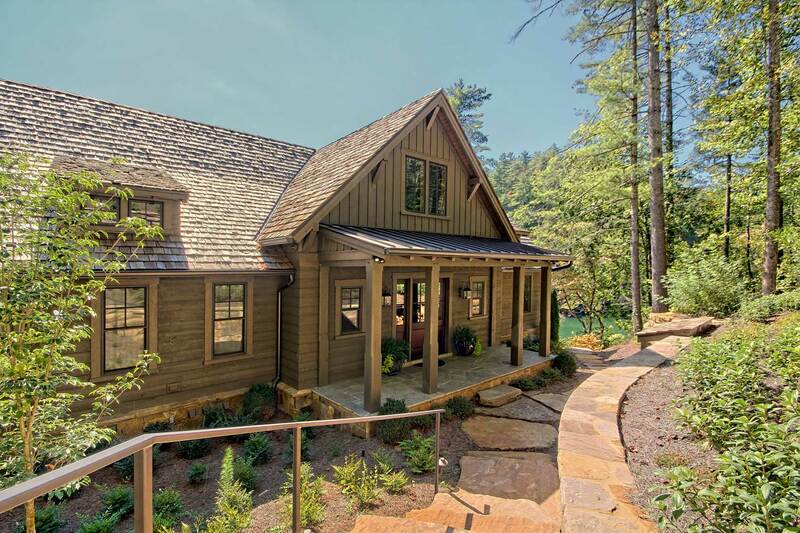 The floor plan is compact due to the terrain, yet the roof line and architecture are undulating reminiscent of the water beyond. 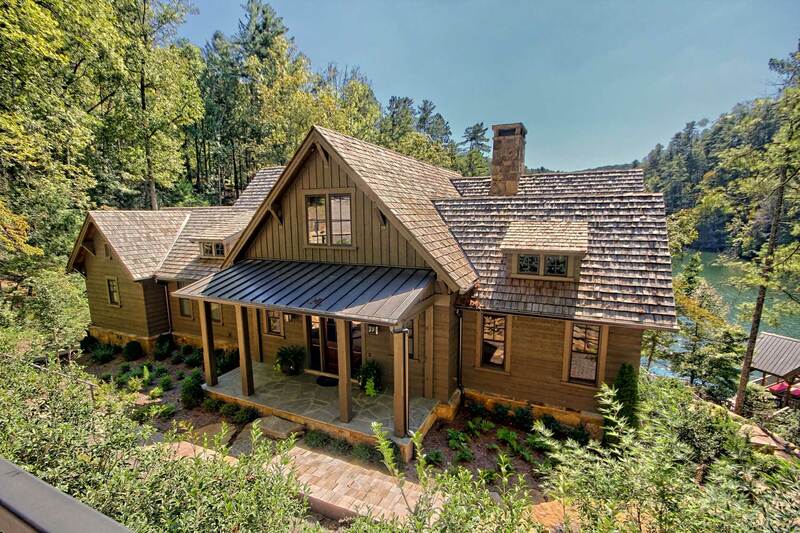 The lap siding with mitered corners, board and batten and cedar shake roof give the home an honest personality and sense of belonging in the wooded lot. 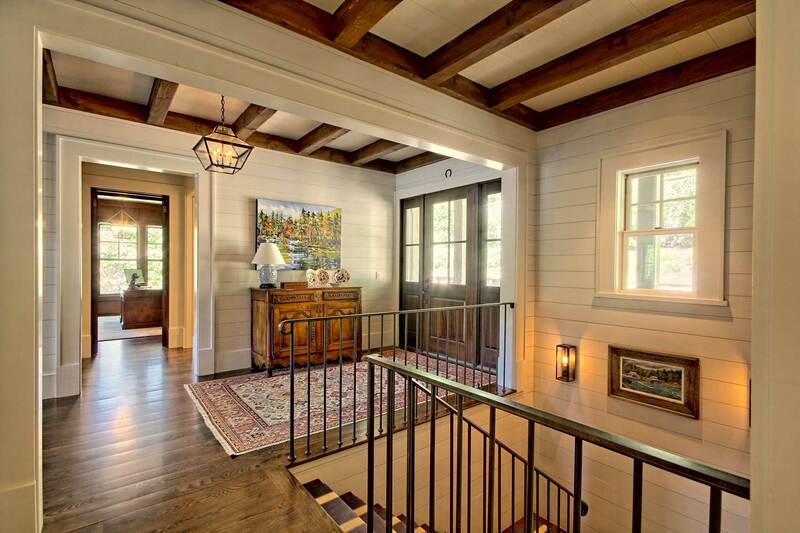 The residents enter on the main floor under a comfortable entry porch into a welcoming bright foyer that leads directly into the vaulted family room and stairs to lower floor. 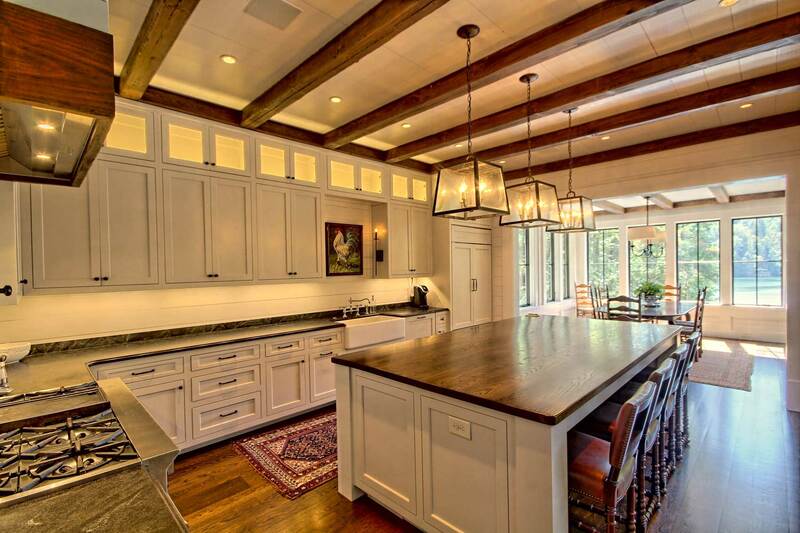 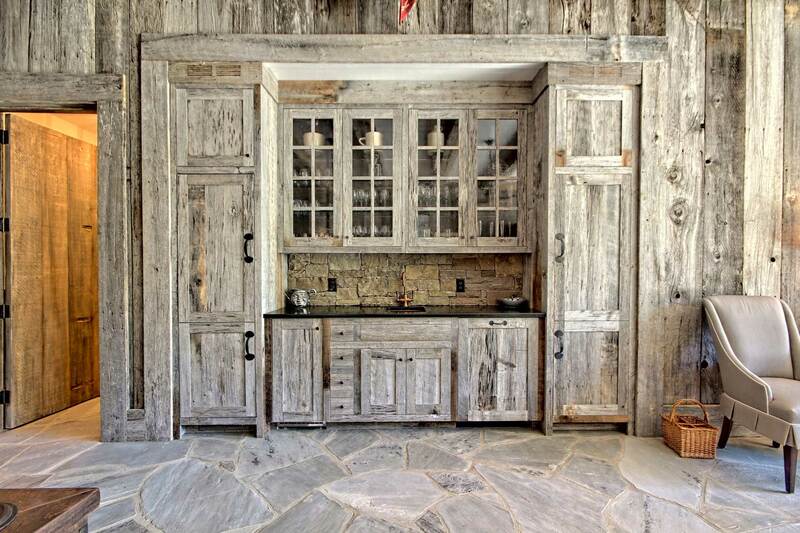 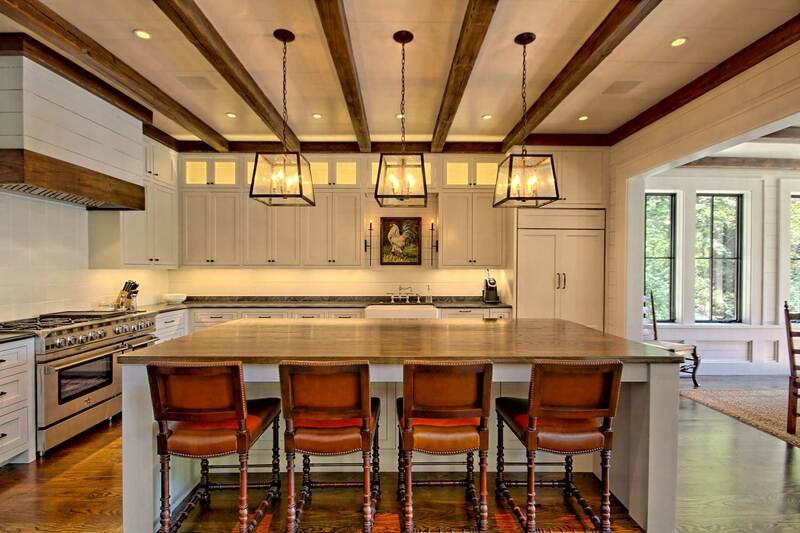 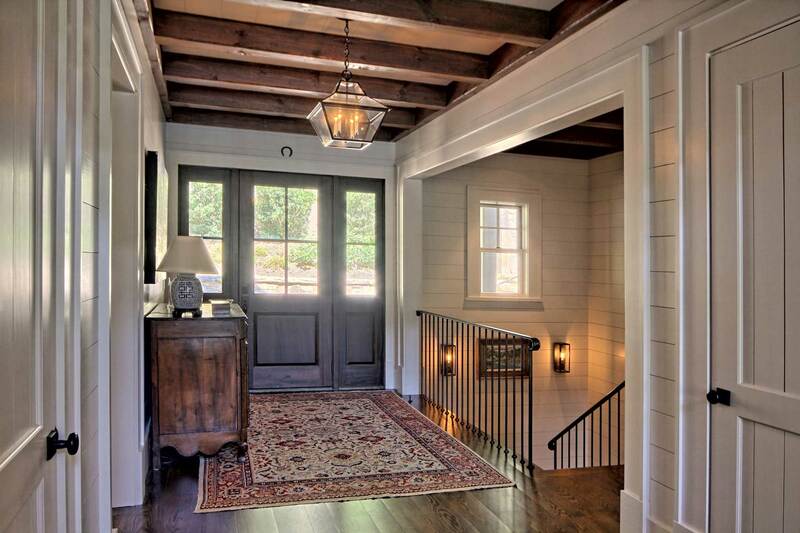 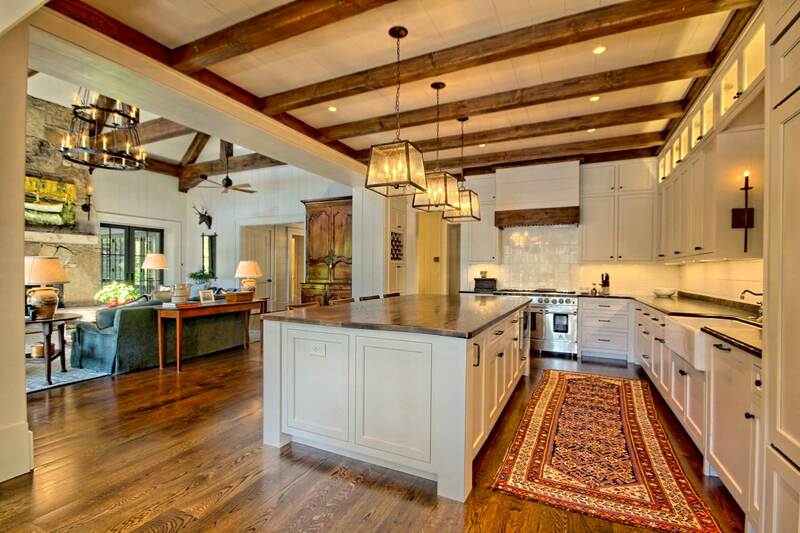 The white wood walls provide warmth in a voluminous space and enhance the open farmhouse architecture. 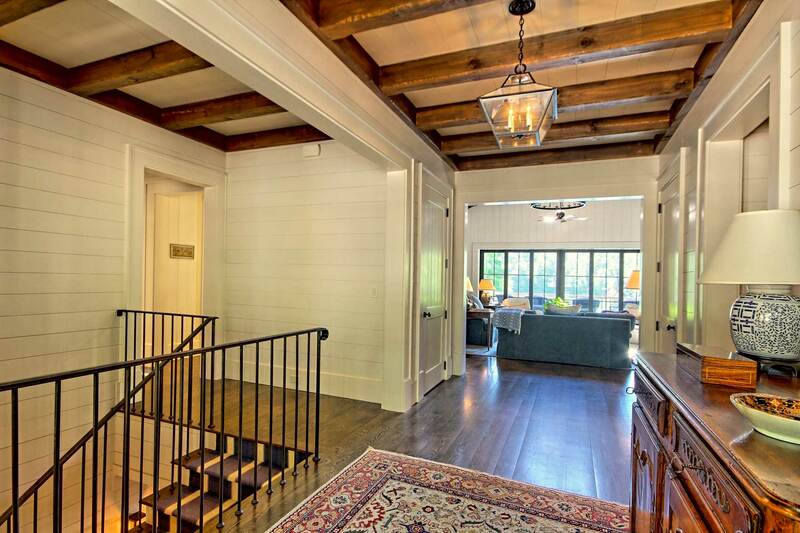 The stained beams give a touch of color and add to the farmhouse style against the crisp white walls. 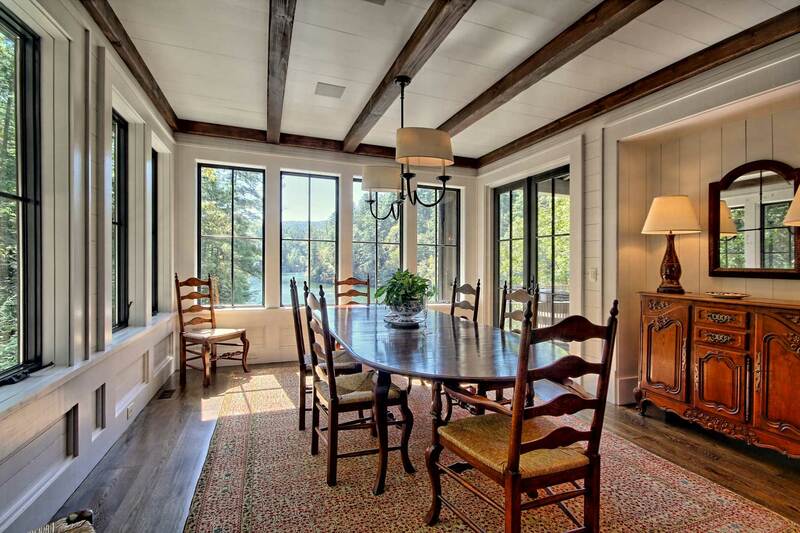 The dining room is surrounded by tall windows that gives a sense of floating upon the lake beyond even though you are well above the water. 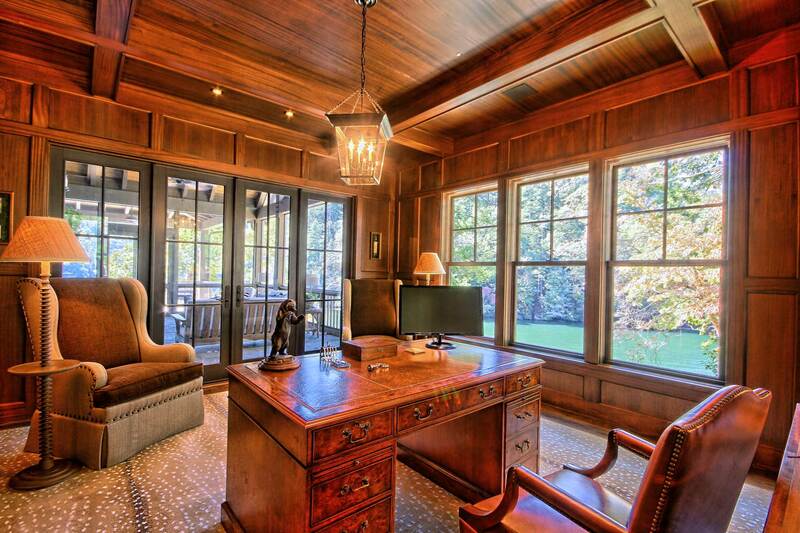 The owner’s study provides a formal office, but is balanced by the adjacent casual screened porch beyond. 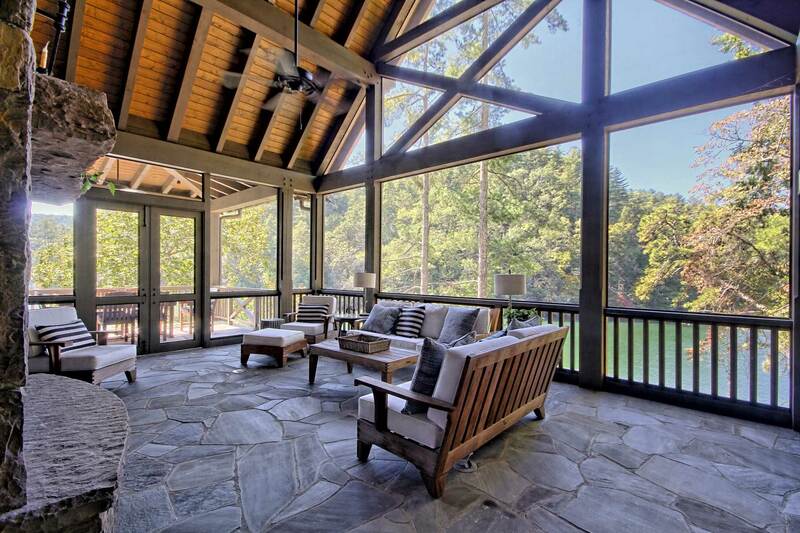 The screened porch and open porch face different directions on the curving narrow lake giving the owners two unique, but joined spaces to enjoy the different angles of the lake. 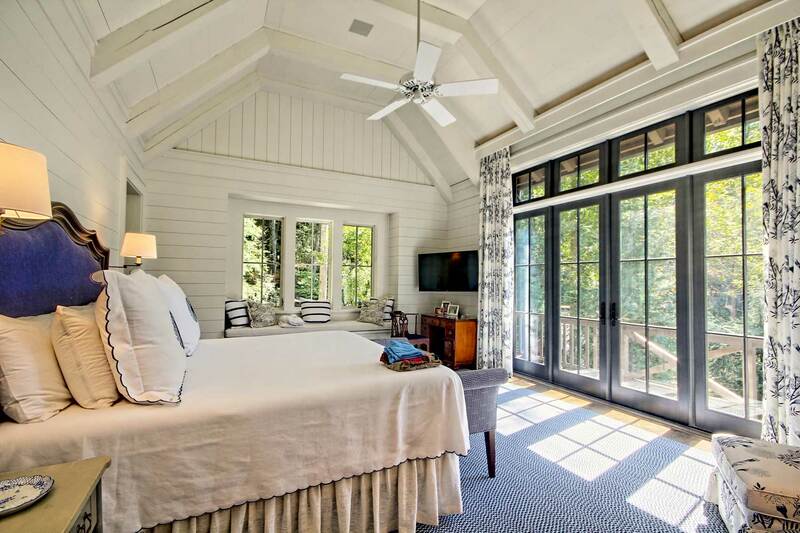 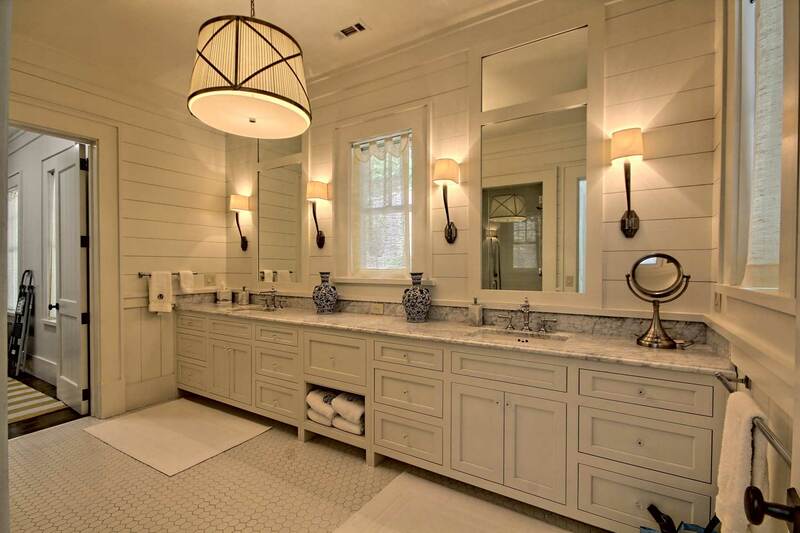 The master suite continues the farm style wood walls, vaulted spaces and lake views, but provides sense of privacy from the rest of the family filled home. 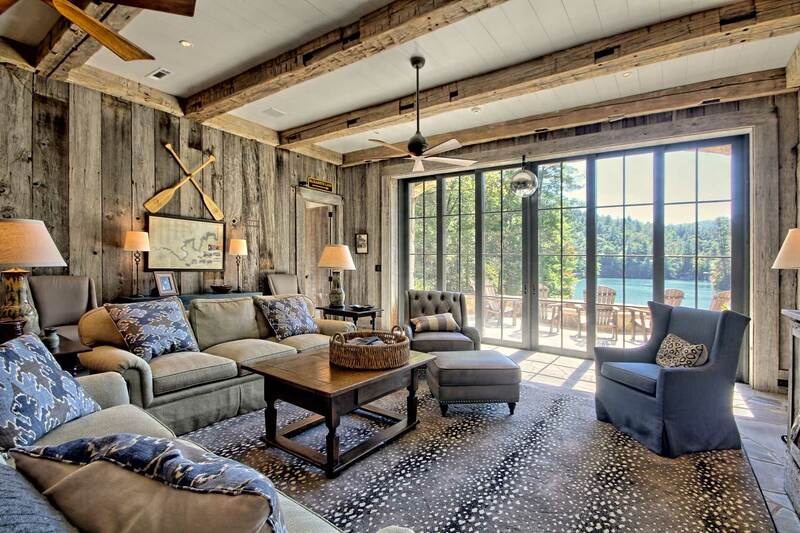 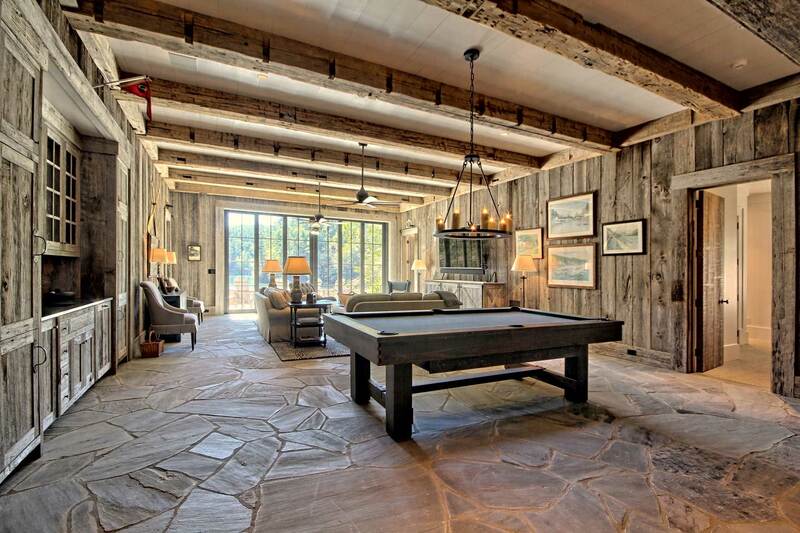 The lower recreation room gives the residents a differing feel than the main floor with its darker reclaimed barn wood, wet bar and large sliding doors that open to the patio and fire pit overlooking the lake. 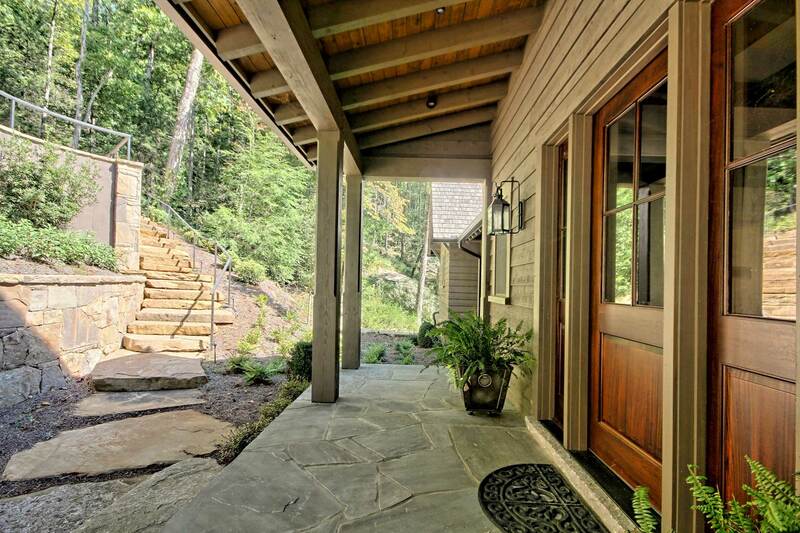 A balanced home situated on a steep lot for a balanced family and their lake lifestyle.